Anyway, I'm feeling much better today and so I've got this cute tutorial for ya. We finished reading the first Harry Potter with the boys, and we promised them a Harry Potter party when we finished. One thing I wanted to do was make owls with them. 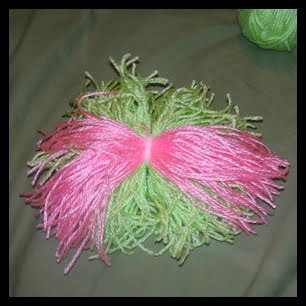 This is a great way to use up some leftover yarn and my boys had a blast winding their owls. We used this tutorial, which is adorable. It worked well, but I have a slightly modified version that is simpler and faster, although not quite as professional. Here are the boys' owls. Maxton's (the middle owl) has longer feet and that is why he is looking up. Maybe he's just more interested in astronomy than the other two. 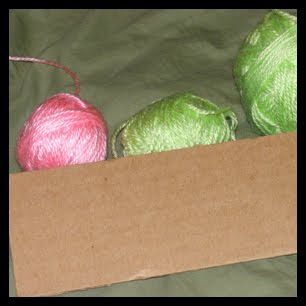 First off, you need a rectangle of cardboard with a slit cut in it (mine is about 2.5" wide, which means my finished pom pom will be about 5" tall), a small zip tie and some leftover yarn. 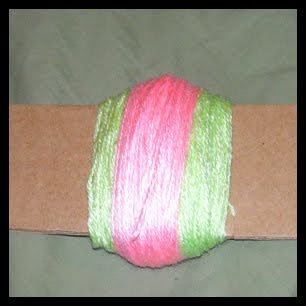 Take the base color yarn (in this case, green), insert the end into the slit to hold it and start winding. 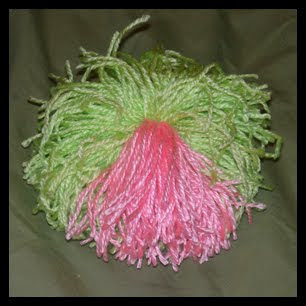 The thicker you wind, the more strands you will have and the fuller your pom pom will be. 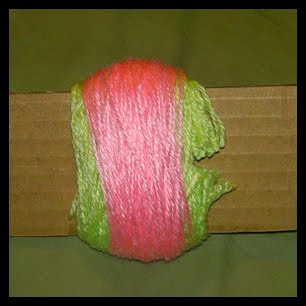 I wound mine about 1 inch thick. Make sure not to go too wide or it won't be easy to gather. 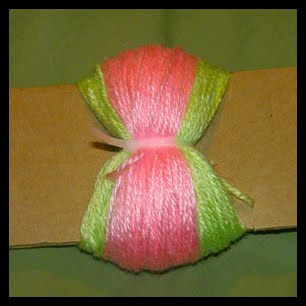 If you want a 2nd color for the belly or some hair, wind the 2nd color over the first. 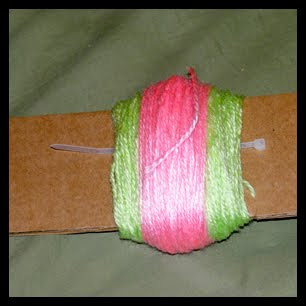 Wiggle your zip tie underneath the yarn next to the cardboard. You can use heavy duty string, but I think zip ties are faster, more sturdy and easier to get tight. Close your zip tie as tight as you can. Trim off the end of your zip tie. Turn your cardboard over and using a pair of sewing scissors, cut down the center. 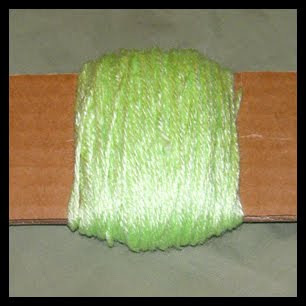 Once you've cut through all the strands, it will look something like this: Trim up so that your strands are more or less even. Add embellishments with hot glue. 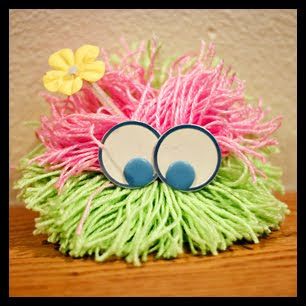 For this monster, I used a pipe cleaner with a paper flower and metal rimmed tags and large brads. This is my little owl. He looks so dejected that even Aubrey noticed and asked me, "Owl sad?" Maxton can't decide if he's more tired or sad. I like him--I can relate. I want to snuggle him, take him out to dinner and movie, and cheer him up. 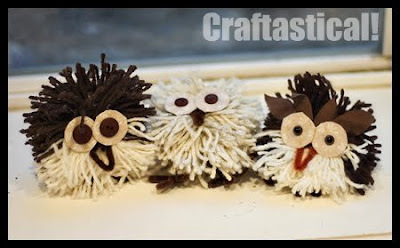 Cute, cute owls! Although some of them look rather startled, lol. I'm sorry to hear that your depression has been hanging around. 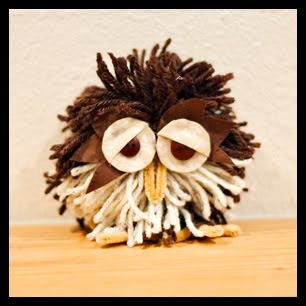 From one who knows exactly what it is like - you are doing well to get out of bed and get dressed in the day never mind making cute owls!. Hope you are feeling happier soon. Love your moody owl!! And, I'm glad you are feeling a better. I love your blog! How stinkin' cute are these?! Love them.